Hello everyone! Hope you're all having a good holiday weekend. Tonight I'm taking a look at another Mattel Cars 3 1:55 scale diecast—Ponchy Wipeout (also known by his sponsor Bumper Save, No. 90)! 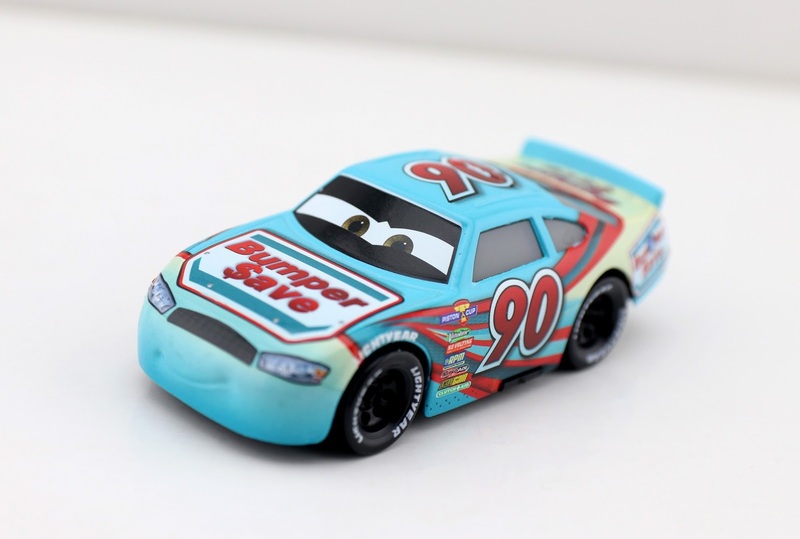 This is another Piston Cup Racer who also appeared in the original Cars, but had a different look altogether (it still doesn't make much sense to me since they look like totally different characters, but I guess that's that). 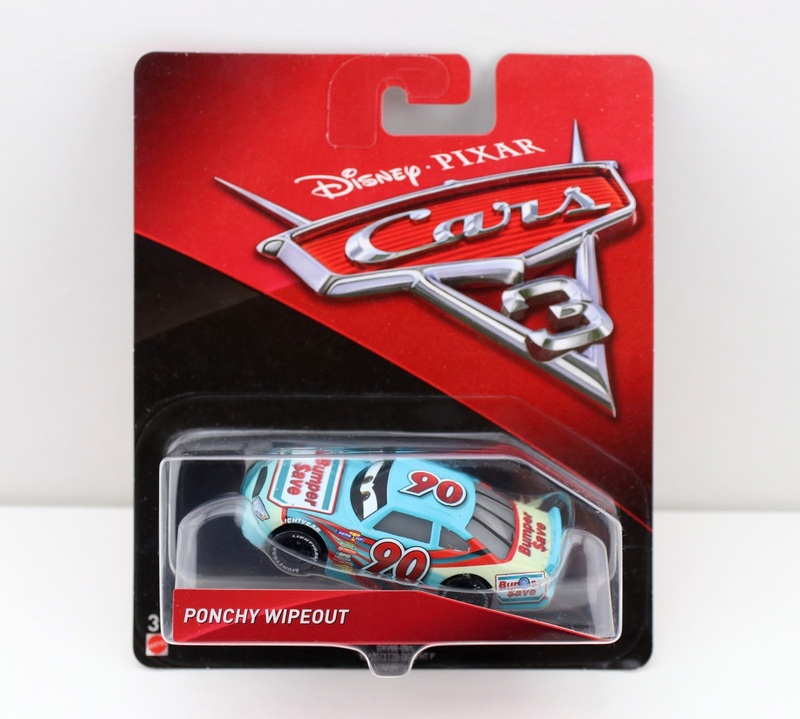 This one was released clear back on May 1st last year in the very first case of Cars 3 diecasts. Again, this character is literally almost impossible to see racing on screen in the film (which is very frustrating). 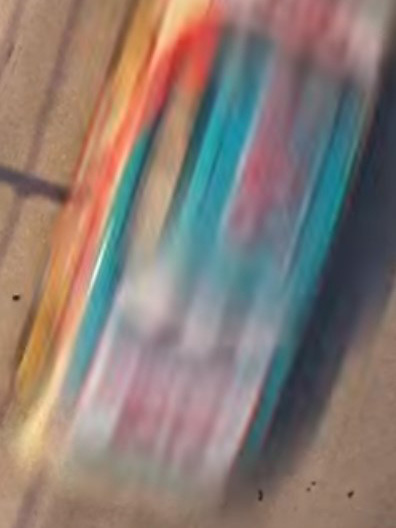 I personally couldn't spot him (and I went frame by frame on the Blu-Ray), so I had to get that blurry screenshot above from his World of Cars Wiki page. If you know where to see him, definitely be sure to comment the time stamp below. But seriously, it shouldn't be that hard. In Cars 3, Ponchy eventually gets replaced by the next-gen racer Paul Conrev. This one is an interesting release since, first of all, he should not have black eyelids (they should be blue). Secondly, there are two versions out there: this one (with the black rims) and one with yellow rims (which is apparently the more movie accurate one, but I couldn't confirm that with my own eyes so I got who I found at the time). Which version did you pick up? Despite being released almost a full year ago, Ponchy here is still VERY easy to find in stores (guess he wasn't much of a hot seller). I can almost guarantee that you'll find him if you pop into one of your local Toys R Us, Walmart or Target stores; so if you missed snagging this one, it's not too late! If you'd rather just pick him up online, here's a direct Amazon link for you. And as always, let me know if you have any comments or questions. Happy hunting!